The colonial-style dining room at India Club. 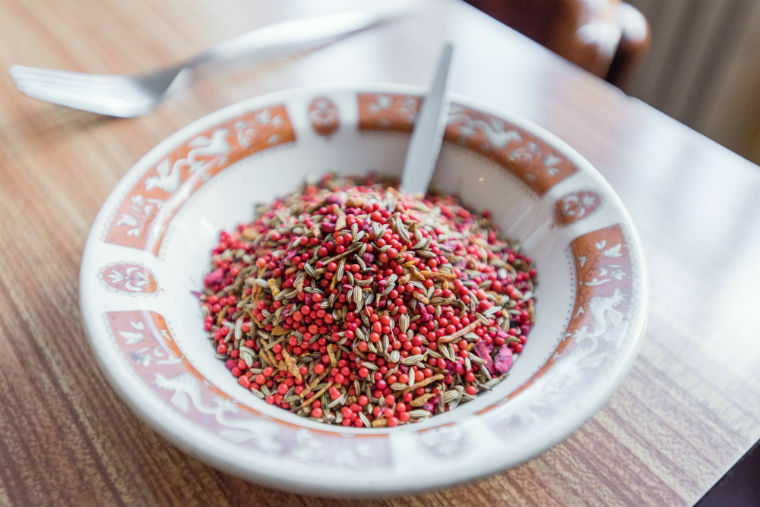 Despite being one of the gourmet capitals of the world with internationally renowned destination restaurants, London has many eateries that are well-kept secrets. These are not just lesser-known places that only a handful of locals and regular customers know about. They might, for instance, be ensconced in a basement, tucked away behind a hidden door, or found in an unmarked, unexpected location. Here we round up a few that you may not have heard of. Did you know that there’s an underground restaurant beneath Shoreditch’s popular, family-run Vietnamese café? It’s something of an architectural wonder. The design is strikingly Gothic, classic and minimalist — all at the same time — featuring embedded dining tables with individual grill stations; plus lots of stone, concrete, and sharp clean lines. It’s a bit like dining in an exquisitely lit cave. There’s a short menu of salads and DIY steak grills. 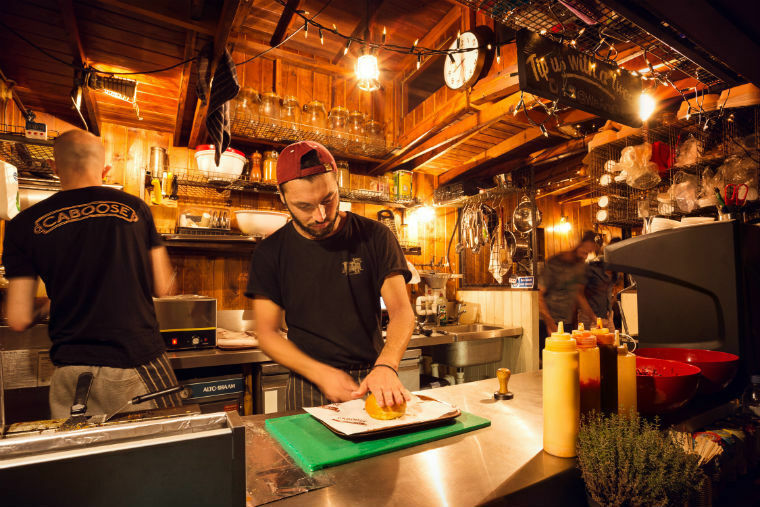 Caboose is a word for the last carriage in a train – and this Brick Lane restaurant is indeed located inside a derelict carriage that’s been restored. You book in advance for private cabin dining, for which there’s a set menu for £30 per head. It’s available for between 8 to 11 people (12 or 13 at a push) between 8pm – 11pm. You can take your own alcohol (corkage is an extra £5 per person), and they provide a large ice chest to keep your drinks chilled. The chefs then cook in front of you; and, for special occasions, the restaurant can also sort out playlists and decorations. The British-American menu focuses on slow-cooked meats, and may include smoked pulled pork belly, pickles and barbecue pit beans with maple slaw. 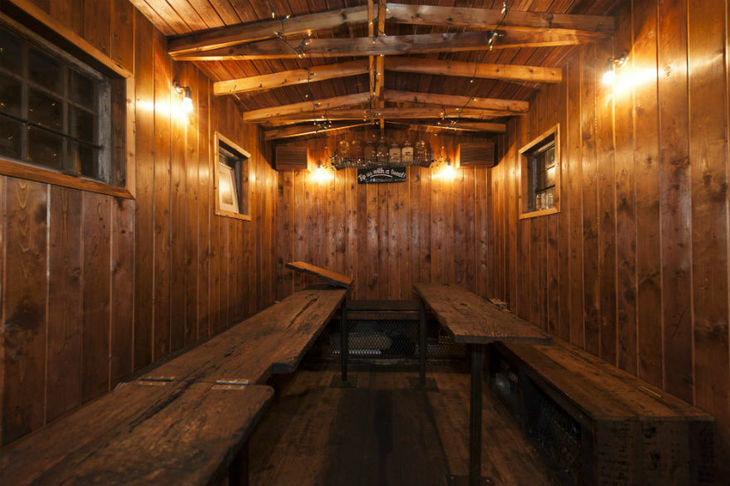 Private cabin dining at Caboose. 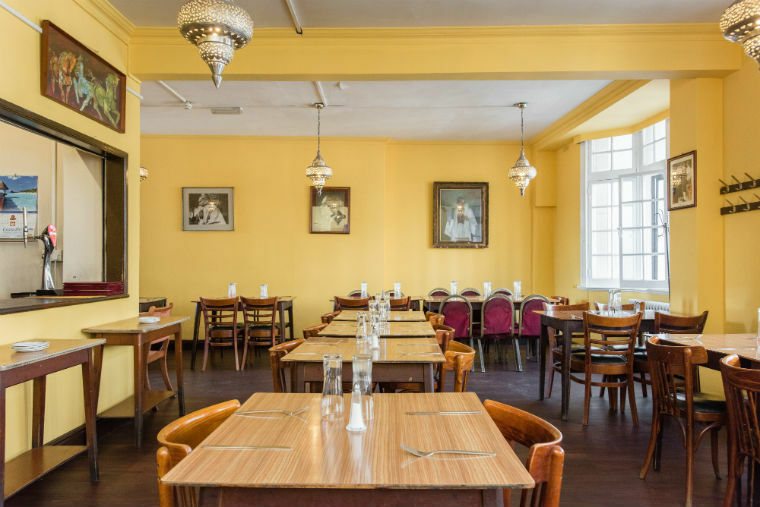 This 70-year old Indian restaurant is one of the capital’s best-kept secrets. Popular with nearby LSE students, academics, writers, lawyers, staff of the nearby Indian High Commission, and even a few celebrities, it’s barely known by anyone else. Climb up a flight of stairs inside the unassuming Hotel Strand Continental, and you’ll discover a quaint dining room and bar that’s untouched by time or fashion. The charming Colonial-style décor shows off Independence-era portraits, and has the feel of a classic first-generation ‘curry house’. Specialising in south Indian cooking, the menu is divided into vegetarian and non-vegetarian sections. Simple, great value dishes include scampi pilau, chicken with mushrooms, egg curry, and snacks like masala dosa. If you’re looking for a quiet place with a difference in central London, this is it. There’s a pretty café inside Maida Vale’s beautiful nursery and garden centre that’s said to be the oldest in the capital. The tranquil spot is located inside the palm house, and is open for breakfast, lunch and afternoon tea. Lunchtime dishes may include Mediterranean vegetable tian, salmon and smoked haddock fishcake, and slow-roasted lamb shoulder flatbread. Don’t miss their wonderful cakes. 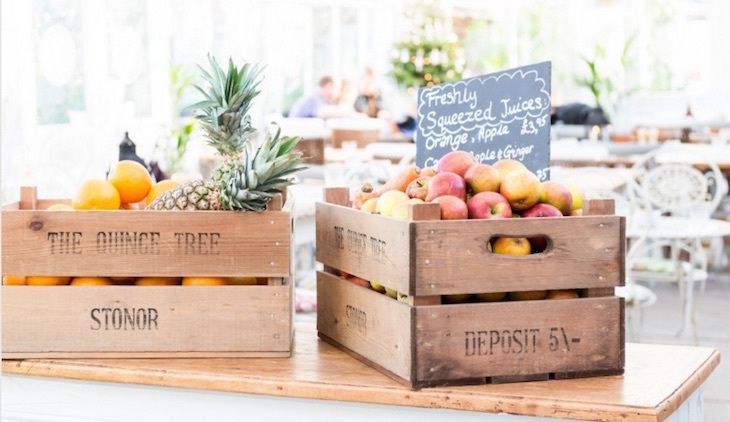 If you’re green-fingered, Clifton Nurseries is a superb day out with the family; and the café is ideal as an off-the-beaten-track venue for a special occasion. Snuggled inside a crypt under St Matthew’s Church, this Brixton restaurant serves classic and contemporary Spanish tapas and cocktails. Attractively presented dishes include blue cheese croquetas with quince aioli, chorizo cooked in red wine, and suckling pig with apple and pear purée. There are DJs at weekends; and the atmospheric venue is a popular party destination for those in the know. 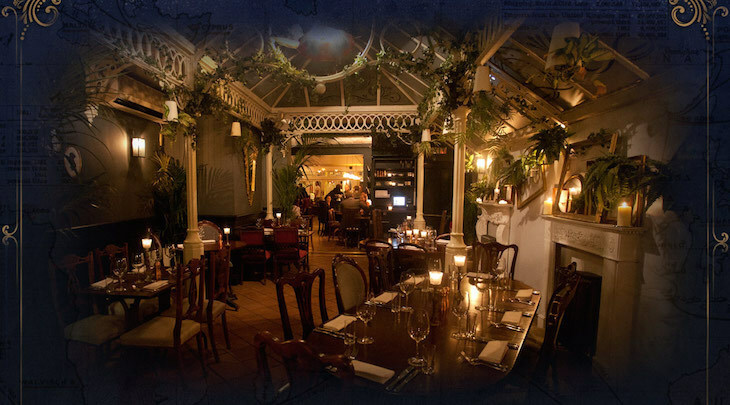 There’s a quirky restaurant in the bright, ornate conservatory at the back of Clapham’s extravagantly decorated neighbourhood bar. It’s an urban take on Colonial and Victorian era paraphernalia, with potted plants and light fittings made out of old gramophones. The food is serious though. The regularly changing menu is based on ingredients that are seasonal and ethically sourced only, they claim, from the UK. Dishes may include pork chop with onion and apple purée, Yorkshire chicken with double cream and white chocolate sauce, and rib-eye steak with tarragon butter and veal jus. The hidden courtyard at Taberna Etrusca, popular with those in the know. This Italian trattoria is not exactly a secret: it’s been around for nearly fifty years. However, it has a pretty courtyard at the back of Bow Churchyard next door that many people may not know about. 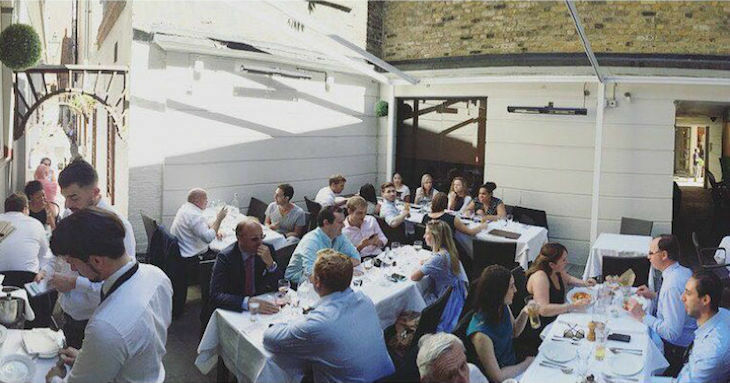 You can dine al fresco in summer, or underneath a marquee set up during the cold winter months. Classic and contemporary Italian fare includes saffron rice arancini stuffed with buffalo mozzarella, grilled tuna steak with samphire, sea purslane and Amalfi lemon sauce, and pan-fried veal chop with sage leaves, butter and white wine. It’s not obvious from outside that this chic Notting Hill boutique (which sells designer clothes, shoes, accessories, artwork and books) hides a trendy café. It’s hugely popular with the locals, but if you don’t know about it, you could easily walk past without noticing it. Breakfast is the quietest time to visit; try classics such as buttermilk pancakes, kedgeree, eggs Florentine, and crab and avocado salad. Open to students staying at the hostel as well as members of the public, barely anyone (who’s not a student) knows about the dining hall inside Fitzrovia's Indian YMCA. It serves fantastic value breakfast, lunch and dinner to eat in or take away. There’s a simple menu of popular classics, including vegetable curry, dahl, tandoori chicken and samosa. It’s not fancy, but hundreds of Indian students swear by its homely, comforting fare. Brixton has its own currency to keep the money earned by local businesses in the area – and now Brixton Pound has opened its very own café. It’s a pay-what-you-feel enterprise, to keep it affordable and inclusive for the local community. Perfectly edible surplus or unsold food from local businesses, which would otherwise go to waste, is turned into nutritious dishes. Red lentil dahl and carrot cake have featured on recent menus, which change regularly. You can support the venture by donating ingredients such as excess fruit and veg from your allotment. 'Mukhwas' at India Club - mouth refresher eaten at the end of a meal.